Chicago is a theater lover’s paradise, with dozens of playhouses serving up something for every taste, from musicals to political dramas. The Windy City is where New York agents scout for theater talent and where many Broadway shows are tested before hitting the road. So the theater scene is truly phenomenal and a must-see, but don’t think you have to hole up for hours without a cocktail. Nope, some Chicago theaters make sure that patrons can settle into a show armed with a drink. Consider these theaters when you want to combine a play with an adult beverage. The critically- acclaimed Steppenwolf Theatre Company produces some of the city’s most thought-provoking plays. As the country’s premier ensemble theater, Steppenwolf has redefined the traditional landscape of acting and performance with an impressive ensemble of 46 members. Take in one of the innovative productions and then head to Front Bar, a stylish spot that supplies beer, cider and craft cocktails like The Dreaming Man, a concoction of CH peppercorn vodka, ginger, lime, cardamom and ginger beer. With four stages in a sprawling multi-level space, Stage 733 hosts a range of theater groups, including Porchlight Musical Theatre, Storytown Improv and Therapy Players so the performance choices are endless. 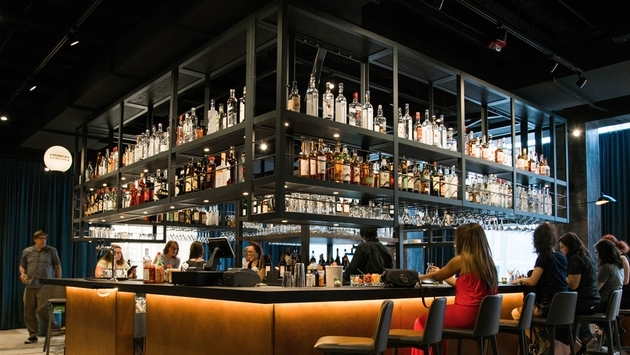 Grab a drink up to an hour before a show at Pop’s Bar, with selections that include locally brewed beer, wine, champagne and an array of spirits. Drinks are served through the end of intermission and can be sipped inside the theater during the performance. An Uptown neighborhood institution, Black Ensemble Theater has produced award-winning musical plays that trace African American cultural history for 40 years. This sleek and intimate theater features live music and exciting performances that are well accented with drinks from the lobby bar. Choose wine, beer or mixed cocktails for an evening of high energy fun. The venerable Second City improv theater is a Chicago hallmark that draws visitors from around the world, eager to experience the comedy style that continues to influence movies, plays and TV shows alike. Drinks and food have been a regular part of Second City shows for years but the theater has recently introduced a stand alone restaurant/bar, 1959 Kitchen & Bar. Located on the second floor of the building, visitors can kick back before or after a show and enjoy organic, locally sourced dishes as well as craft beer and cocktails.